The external sector constrains Cuba’s economic growth by failing to generate sufficient foreign exchange through exports and capital inflows to sustain a high level of investment. This paper examines Cuba’s external sector by focusing on external cash flow in the light of convertible currency and barter trade sectors and international banking statistics. The paper also analyzes the adequacy of the nation’s international liquidity and current policies in the face of potential external sector shocks, crucially the possibility of the sudden stop of the barter trade and finance from Venezuela. But Cuban current account data differ markedly from actual cash flow, as payments do not accompany a large part of trade and services transactions. Consequently, the current account shows an incomplete picture of external sector balance. One key difficulty is the accounting of Cuban non-traditional exports of health and education services. These exports are part of a barter arrangement between Cuba and Venezuela which have been described in a number of articles and official publications.3 Payment for Venezuelan crude oil and other petroleum products takes the form of services by Cuban personnel but prices and payment mechanisms are unclear. There is no transparent financing flow associated with these transactions, though it is evident that a sizable transfer of resources is taking place from Venezuela to Cuba. A related problem applies to trade with a number of other countries. The bulk of Cuban imports that come from Angola, Brazil, Bolivia, China, Ecuador, Nicaragua, Russia and Vietnam are financed bilaterally by official banks and other state entities. As far as we know, there is no statistical information on the financing accompanying this trade. In this paper Venezuela and those eight other countries are treated as a group effectively engaged in barter trade that is self financed bilaterally, and it is not feasible to match trade numbers with capital account transactions. Trade with other nations settles in convertible currencies and trade transactions match payments. In this paper, convertible trade is separated from barter trade. The Central Bank of Cuba does not publish data on international reserves. One high quality source of data for Cuban international liquidity is up-to-date reporting on the assets and liabilities of Cuban banks, including the Central Bank, to international banks of 43 countries and financial centers reporting to the Bank for International Settlements. Cuban bank liabilities correspond to trade financing and other loans made to Cuban banks by most of the world’s international banks. Cuban bank assets are deposits in the same international banks and constitute the bulk of the hard currency available to the Cuban government and state entities to meet short-term international financial and trade obligations. Cuban bank assets reached $5649 million on September 2011, an increase of $368 million from September 2010 but unexpectedly fell to $4109 million by the end of December 2011. Nonetheless, in five years assets rose $2.7 billion, a significant sum for an economy with weak international credit, undergoing severe difficulties with traditional exports and needing to import much of its foodstuffs in adverse international markets. Some of the increase in Cuban assets abroad is needed to provide cash and collateralized financing for essential imports, as trade credit and other bank credits to the country have tightened. This can be seen in the red line of Chart 1, which shows a steady decline since 2007 of Cuban liabilities to foreign banks. A question posed below is the role of the accumulation of financial assets as a defensive mechanism against potential external shocks. Table 1 shows an estimated summary external cash flow for the period 2008–2011. During this period, Cuba has been running a large deficit in the convertible trade balance largely because of weak exports and the weakening of Cuba’s farm output, which requires the importation of the bulk of the island’s foodstuffs. Austerity measures since 2008, a tightening of the allocation of foreign exchange to state companies and the recovery of nickel prices resulted in the halving of the trade shortfall by 2010. There are no official numbers for 2011, but an acceleration of growth and a loosening of the availability of foreign exchange to official importers suggest a somewhat larger trade deficit for 2011. The convertible trade deficit is partially offset by a surplus on convertible services driven by Cuba’s tourism receipts. Revenue from tourism averaged $2.2 billion per year in 2008–2010 according to official Cuban data, and it likely exceed that number in 2011 by around $200 million given a reported rise in the number of visitors. Items C and D are small. Interest payments and royalties, C, is an estimate based on official Cuban balance of payments data for 2008. Item D, lending by BIS reporting banks to Cuba, is a hard data item. Item F, change in non-BIS external assets, is an educated guess based on the need for liquid assets in banks of barter trade countries to finance some trade operations such as transportation and imports from private entities in those countries. An unexpected and rapid shift out of BIS deposited assets in the last quarter of 2011 suggests a portfolio reallocation as well as a use of reserves to finance imports. This is partly shown as an estimated increase in non-BIS bank assets of US$0.5 billion in 2011. 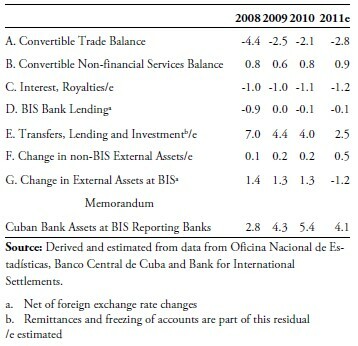 Change in external assets at BIS banks, G, is hard data, enabling the calculation of a convertible currency residual, item E, “Investments, lending and transfers.” This is a key line in the table, and it shows sizable cash flowing to Cuba, peaking in 2008 at US$7 billion, down to an average of US$3.6 billion per year in 2009–2011. There are two key components of Item E: remittances from Cubans living abroad and investments, finance and transfers from Venezuela. Cash flowing from Venezuela includes investments in joint ventures, hard currency loans and grants.4 Proceeds from the freezing of foreign accounts were also a sizable component in 2008. There is a wide range of estimates for remittances by various analysts and surveys such as Orozco and the Inter-American Development Bank.5 These place annual remittances in the range of US$800 million to US$1200 million, and Cuban sources are attributed a somewhat higher estimate. Since 2010, remittances appear to be increasing given the higher number of Cubans visiting relatives. 6 However, it appears that much of the increased transfer takes place in the form of consumer products and tools used directly by relatives and friends and as merchandise and working capital for newly-established small businesses. Assuming a rough number for cash remittances of around US$1 billion per year7 and US$0.8 billion from freezing of foreign accounts, then cash flow from Venezuela was US$5.2 billion in 2008, the peak year of the recent crisis, and some US$2.4 billion estimated for 2011. At an average price of near US$98 per barrel, Venezuelan shipments of petroleum in 2011 are worth US$3.9 billion. On this basis oil and cash flow from Venezuela in 2011 reached US$5.4 billion or close to 9 percent of GDP at official exchange rates but a much higher percentage at a far lower peso exchange rate that a unified equilibrium exchange rate imply. Liquidity available to the Central Bank and other Cuban banks is represented by the assets held at BIS reporting banks, which amounted to US$5.7 billion in September 2011 and US$4.1 billion in December 2011. Lacking data on international reserves from the Central Bank of Cuba, the BIS data represents the best estimate available of Cuban international liquidity. It forms the basis for the analysis of Cuba’s first line of defense regarding potential external shocks. Cuba’s international trade has undergone a significant shift since 2005. 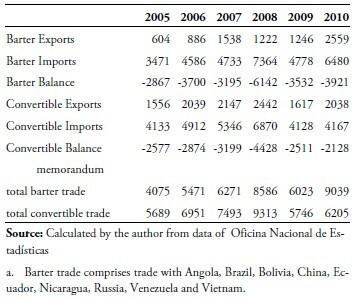 In that year barter trade represented a bit more than 40 percent of overall merchandise trade.8 In 2010 barter represented almost 60 percent of all trade, underscoring the concentration and dependence on the oil barter trade with Venezuela. There are two major forces driving the value of trade. One is the rise of international oil prices. This is reflected immediately in the barter import data as Cuba relies on Venezuela for nearly all its oil import requirements. The second element is the austerity measures taken by Cuba in 2008 and continued since then. This hit capital good imports more than proportionally since they are largely sourced through convertible trade. Capital goods imports in 2010 were 44 percent below the level of 2008 and were even below the figure for 2005. Barter trade is self-financed.9 This has provided Cuba with immense sustenance in recent years. It means, looking at it from a different angle, that Cuba can center on financing its convertible imports. However, the future could well look different. What about a shift in Venezuelan policy regarding Cuba and a reduction or suspension of current oil barter arrangements? Below is a look at the implications of potential external shocks for Cuba’s international liquidity. Target liquidity needed to dampen the impact of potential shocks, Z*, is equal to the probability of a shock here referred to as the stop of barter trade, Pr(S), times the level of barter imports. In the literature, a critical shock facing an emerging country is taken to be the sudden stop of capital flows.13 In the Cuban case, because of default and arrears on external debt going back to the early 1960s, there are few capital flows to be stopped. The critical shock to be guarded against is that of an end or sharp reduction of barter imports, which are obtained at highly concessional terms. Alternatively, barter imports plus additional transfers or lending from barter partners can also be used to gauge the size of a prospective shock. In any case, the government will want to assess the likelihood of a shock in the form of a stop of barter trade in its design of a reserve or liquidity policy. This result follows the form of the objective function, which can be modified to represent a variety of government preferences. A constraint on the availability of external liquidity can also be imposed on the objective function. This is shown in the Appendix, which derives Z^ under a budget constraint from the convertible trade balance as a function of the exchange rate and capital flows. In this section the unconstrained objective function is used which yields a range of interesting results for Z^ and R^ set against available data on international liquidity. This means that optimal liquidity needed to mitigate the effects of a stop in the barter trade will be the sum of expected values of barter import losses over the policy horizon where β<1 is the discount factor per period n and Mb,n is barter imports in year n. We can calculate the value of Z^ at the beginning of the policy horizon.15 For example for Pr(S) = .3 and β = .8 , Z^ will be equal to 1.5 times barter imports. It will be useful to examine Cuba’s international liquidity in the context of the framework outlined above. The key question involves the adequacy of liquidity to meet convertible trade needs and as a cushion against a stop of barter trade. 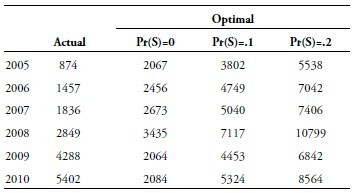 Table 3 shows the result of a simulation that yields optimal international liquidity for Cuba for 2005– 2010. In this simulation actual liquidity obtained from the BIS is compared to the optimal results. The latter assume three yearly probability levels, 0, .1 and .2, for the end of barter trade caused by a stop or disruption of Venezuelan shipments of oil and additional finance. Throughout the calculations β = .8. This factor discounts future import flows and adjusts for the use of a constant annual probability of a stop of barter trade. The first column of optimal liquidity shows results at Pr(S) = 0 meaning that optimal liquidity is derived only from the need to cover convertible imports. Here the assumption is that the import coverage ratio is equal to six months’ imports (γ = .5), a level that would allow the government to assure collateralized trade finance for convertible imports by pledging its assets in BIS banks. Under this calculation Cuba experienced a shortage of liquidity in 2005–2008 and an excess of liquidity for 2009 and 2010.16 But why does Cuba maintain this apparent excess liquidity? At an annual Pr(SBT) = .2, the sum of discounted probabilities over a long period approaches 1, and it is .74 over five years. In this case the observed Cuban liquidity is clearly insufficient. The government is unable to raise liquidity because of the weakness of convertible trade, poor financial access and alternative needs among them the urgency to import essential foodstuffs. Undoubtedly the Cuban government has in mind other strategies to provide a cushion against a Venezuelan shock. There is some evidence that Cuba is trying to diversify its barter trade with agreements with other nations, among them Angola and possibly Algeria. Cuba would presumably obtain oil in exchange for health services. At present, trade with those two countries is very small. Rather than relying on deep structural reform to make the economy more internationally competitive, the government’s main approach to guard against a major shock is to develop offshore oil and gas that can ease dependence on Venezuelan barter arrangements. 18 Offshore oil development is now in an exploratory stage and many analysts believe that it will take at least five years to bring production so that it can cover the bulk of domestic needs. Deep reforms to change the structure of the economy to provide a substantial role for private enterprise and markets that would improve investment and international competitiveness are not yet in the cards.19 Reforms announced at the VI Party Congress in 2011 and measures by the Council of Ministers accompanying them relegate the external sector to a secondary role.20 The approved guidelines referring to the external sector are mostly a statement of good intentions devoid of specific policy mechanics. The new decrees and laws announced in 2011 and through April 2012 are geared towards improving the fiscal situation and boosting parts of the domestic economy particularly small-scale business and the secondary market for houses and cars but have little to do with establishing competitive and flexible market structures that will provide an adequate response to external shocks. Only new agricultural policies designed to boost small farms and cooperatives will have a positive impact on the external accounts by helping to raise foodstuff production. Below two important areas for reform, exchange rate policy and state enterprises are discussed. Dual currencies, exchange controls and foreign exchange allocation to ministries and state companies result in multiple exchange rates and engender antiexport distortions, misallocation of capital, extra fiscal taxation and corruption. Previous experience during the Special Period and into the last decade indicates that external shocks are dealt with administratively by rationing foreign exchange and import controls creating a new set of distortions, hindering economic efficiency. Movements towards a market clearing exchange rate would help provide a cushion against potential shocks in several ways. First, it would contribute to an increase in liquidity available to dampen disturbances by raising convertible exports and improving the allocation of imports. Second, it would improve domestic allocation of production. Third, a flexible exchange rate policy would contribute to offset the impact of shocks. It appears Cuban officials are reluctant to undertake monetary and exchange rate unification afraid of the negative impact on basic consumption by the population. The system as it now operates provides an implicit subsidy for the purchase of basic foodstuffs that are imported by a state agency at a highly overvalued exchange rate. This points to the need to consider explicit subsidies for foodstuffs to replace those operating through the exchange rate mechanism as unification takes place. State enterprises are key players in Cuba’s external sector as they are involved with the bulk of exports, imports and tourism as direct participants and as trading companies on behalf of the government and its agencies. On the other hand, as described above, the reforms in motion over the last two years leave the new private enterprises without a meaningful role in international transactions. Cuba’s main exports nickel, medical products, petroleum distillates, and tobacco are controlled by state companies directly or by tightly structured joint production agreements with foreign corporations. State corporations control the import of foodstuffs, capital goods and technology. At this time there are few signals that 1) a competitive market environment for products, labor and capital is being developed in which state enterprises can flourish and 2) that either substantial reforms of management and governance of these enterprises is being contemplated or, preferably, privatization measures to create independently operating entities. Turning some weaker state enterprises into worker cooperatives, as has been signaled by party officials, without meaningful reforms in management and incentives will not suffice. The experience of emerging market economies, including socialist states such as China and Vietnam, strongly point to the need to tackle the deep productivity problems engulfing the Cuban state sector. Cuba’s external accounts include sizable barter trade with Venezuela and a few other countries where trade transactions do not match payments and now account for some 60 percent of all Cuban merchandise trade. In this context, it is useful to examine Cuba’s external cash flow. It denotes a strong flow of finance and transfers to Cuba that peaked at US$ 7 billion in 2008 and has oscillated around US$4 billion per year in 2009–2011. Simultaneously, Cuba accumulated external financial assets in major international banks that at the end of 2011 reached US$ 4.1 billion. A simulation using a policy model attributes a substantial part of this liquidity to the need to ameliorate a potential shock from the stop of barter trade with Venezuela. Major policy reforms directed towards improving international competitiveness would provide protection against shocks, but are not yet in sight. Exchange rate policy and reform/privatization of state enterprises are key policy areas essential to strengthen the external sector. This Appendix examines the government’s objective function towards international liquidity when constrained by a budget. The government wants to optimize the objective function subject to an external sector liquidity constraint. Λ is the constrained objective function. where g + heθ is the sensitivity of the convertible trade balance to deviations of the exchange rate from the market clearing rate, θ is the sum of elasticities of exports and imports with respect to the exchange rate and g and h are constants expressing initial conditions of the balance on convertible trade and tourism. Here, e = E/E* where E is the exchange rate or, in Cuba’s case, a weighted average of the multiple exchange rates expressed as CUPs per US$, and E* is the market clearing rate. At a unified exchange rate at equilibrium, E = E* and e = 1. K is the given net cash capital flows and transfers. As previously defined, R and Z are the liquidity to back up trade and to dampen shocks. λ is the Lagrange multiplier. The three terms in brackets in equation (A6) express the liquidity derived (or needed) from the convertible trade balance at given exchange rates, the liquidity from net capital inflows after coverage of convertible imports, and liquidity needed for the expected value of a stop of barter trade. In Cuba’s current situation e<1 and there is a slight surplus (2010) of US$ 0.1 billion in convertible trade plus tourism according to official Cuban data. Policies that enhance liquidity derived from convertible trade will ease the budget constraint and allow an increase in Z^. One such policy is unifying the exchange rate near market equilibrium. The size of the impact will be greater in proportion to the elasticities, θ, that reflect the sensitivity of exports and imports to a movement of the exchange rate. There is insufficient data to calculate the value of θ and other parameters in equation (A6). Data on specific imports and exports indicates that they face inelastic price elasticities, of demand and supply which suggest low elasticity with regard to the exchange rate. Foodstuff demand and nickel exports are price inelastic. We estimate the price elasticity of nickel exports at 0.7 on data for 1986–2010 and price elasticity of demand for imported foodstuffs at -0.1. However, non-traditional exports will be more responsive to prices if vigorous structural reforms of markets and finance are undertaken. 1. This paper benefitted from the thoughtful comments of Ernesto Hernández-Catá, Lorenzo Pérez and Roger Betancourt. All remaining errors are the entire responsibility of the author. 2. CEPAL estimates the 2010 current account deficit at 0.3 percent of GDP and reports an improvement for 2011, CEPAL, Balance Preliminar de Economias de America Latina y el Caribe, 2010 and 2011. 3. See for example Rolando H. Castañeda, “El Insostenible Apoyo de Venezuela a Cuba y sus Implicaciones,” Cuba in Transition— Volume 20, ASCE, 2010, and Luis R. Luis, “Cuban External Finance and the Global Economic Crisis,” Cuba in Transition—Volume 19, ASCE, 2009. 4. Other countries engaged in barter trade with Cuba may provide cash transfers and finance. Nonetheless, the bulk of their financing and transfers are tied to barter trade transactions. 5. Manuel Orozco, “On Remittances, Markets and the Law: The Cuban Experience in Recent Times,” Cuba in Transition—Volume 19, ASCE, 2009; Mario A. González-Corzo, “ASCE’s Contribution to the Literature on Remittances: 1991–2009,” Cuba in Transition—Volume 19, ASCE, 2009; and Inter-American Development Bank, “Remittances to Cuba from the United States,” Surveys, 2008 and 2009. 7. This is the figure roughly estimated by Orozco, op. cit., for 2006 and 2007. He estimates it at $1.2 billion for 2008. 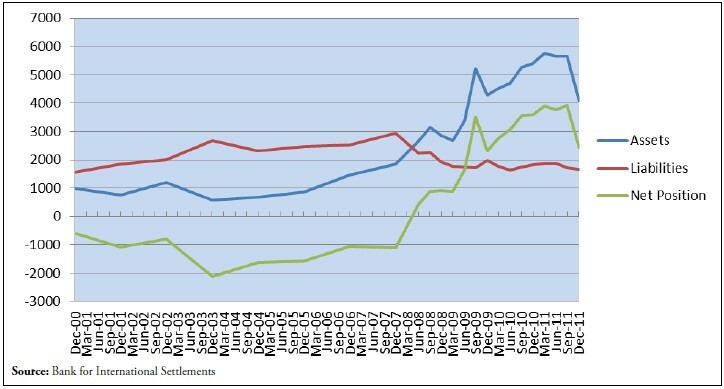 Overall remittances are likely higher in 2010 and 2011 but with most of the increase probably being remittances in kind. 8. These figures refer only to merchandise trade. Including barter services would reinforce the point about the driving role of barter trade. Pricing and payments arrangements regarding Cuban services exports to Venezuela and other Latin American countries such as Nicaragua present difficulties in interpreting official statistics. 9. In strict terms not every barter transaction is financed by some form of official credit or grant and some trade with China, Russia and other barter partners may take place in cash. There is no way to separate cash trade from that tied to official finance so all trade with China and Russia is considered to be barter. 10. International reserves on the other hand would be indispensable for a complete analysis of the balance of payments and monetary policy. 11. An article which looks at optimal international reserves in terms of designing a hedging strategy is R. Caballero and S. Panageas, “Contingent Reserves Management: An Applied Framework.” Cambridge, Massachusetts: National Bureau of Economic Research, 2004. 12. Central banks may also want some liquidity for operations in the foreign exchange market. Pervasive capital controls in Cuba are a rough way to reduce this need. 13. See Sebastian Edwards, “Thirty Years of Current Account Imbalances, Current Account Reversals and Sudden Stops,” Staff Papers, IMF, Volume 51 (10), pp. 1–49, 2004; Dani Rodrik, “The Social Cost of Foreign Exchange Reserves.” Cambridge, Massachusetts, National Bureau of Economic Research, 2006; and Caballero and Panageas, op. cit. 14. In this case we can define U = – 1/2μ(R–R*)² – 1/2α(Z–Z*)², where R and Z are current levels of the two types of liquidity, and μ and α are parameters expressing the government’s sensitivity to liquidity targets. Substituting (2) and (3) and optimizing in regards to R and Z we obtain Z^ in (3’) and the corresponding expression for R^ = R* = γMc. 15. Over a long planning horizon the value of Z^ at period 0 will be approximated by Pr(S)Mb/(1–β). We do not make ΣβnPr(S) =1, so that Z^ can exceed one year of barter imports. Mb is in constant year 0 dollars. 16. This result should be adjusted for the changes in actual trade finance from BIS banks, but doing this does not substantially alter the outcome. For example a US$0.5 billion increase in trade finance in 2005–2007 still would leave Cuba with a shortage of available liquidity. In addition, a US$0.2 billion decrease in 2008–2011 would also make little difference. 17. R. Castañeda op. cit., and Castañeda, “La Ayuda Económica de Venezuela a Cuba: Situación y Perspectivas—Es Sostenible?.” Cuba in Transition—Volume 19, ASCE, 2009. 18. Larry Luxner, “Jorge Piñón: Cuba’s enormous oil and gas potential.” Cuba News, April 1, 2009. 19. In April 2012 Cuban Vice President Lazo said that in four or five years, 40% to 45% of GDP would be in the non-state sector, but he did not specify what “non-state” means. “Cuba Plans Massive Shift to Non-State Sector.” Reuters, April 23, 2012. 20. For a summary of reform measures see Jorge F. Pérez-López, “Cuba’s External Sector and the VI Party Congress,” Cuba in Transition—Volume 21, ASCE, 2011. 21. Banco Central de Cuba, Financial Statements, December 31st, 2009. Interaudit, 2010. 22. Banco Central’s summary balance sheet does not provide a breakdown between CUP and CUC liabilities. Presumably they are properly consolidated as CUPs. 23. Ernesto Hernández-Catá, “Macroeconomic Effects of Exchange rate and Price Distortions: The Cuban Case,” Cuba in Transition—Volume 21, ASCE, 2011, discusses the economic effects of controls and the output gains from liberalization.